You shouldn’t have to worry about food allergies when you’re booking a cruise, let alone when you’re on a cruise. Thankfully, cruise lines have a system in place for accommodating passengers with special dietary needs — although some are more thorough than others. When You Book: Email a Special Needs Form to the Special Needs Department at special_needs@azamaraclubcruises.com at least two months prior to sailing. Onboard: After boarding the ship, you’ll receive an invitation to meet with the restaurant manager and executive chef to discuss your allergy. Passengers with dietary restrictions are flagged in a restaurant reservation system, so whenever a passenger checks into the main dining room or a specialty restaurant the server is made aware of the allergy. As a precaution, remind your server at every meal. If you wish, you can pre-select your evening meals the night before, too. When You Book: Dietary requests are handled onboard the ship, so there’s no need to inform Carnival in advance. However, if you have questions email the Special Requests Department at specialneeds@carnival.com. 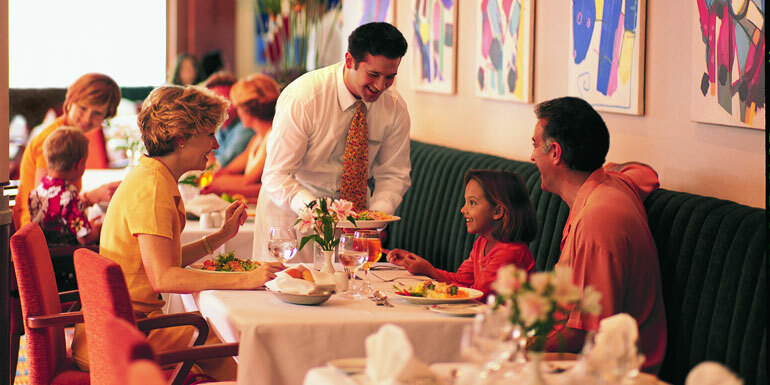 Onboard: Discuss your food allergies with the head waiter at dinner on the first night of the cruise. Allergies can best be accommodated in the main dining room. When dining in the Lido buffet, speak with the senior dining staff. When You Book: Email the Special Needs Department 40 days prior to sailing and inform them of your allergy at special_needs@celebrity.com. Onboard: On the first evening, speak with the Maître d' and let them know you have allergies, and remind your server at mealtime too. In the buffet, talk with the manager and they can answer any questions about ingredients in a particular dish. When You Book: Submit your written dietary requests to the Onboard Guest Services Department by emailing onboardgstsvcs@crystalcruises.com at least 3 months before sailing. Onboard: The information is passed along to the kitchen and service staff, but confirm your needs with them again on embarkation day. You should also remind your server of your allergy at each meal. When You Book: Let Costa or your travel agent know about your allergy during the booking process. Onboard: Confirm your dietary requirements with the Customer Service office once you board the ship, and remind your server at meal times, too. When You Book: Let Cunard or your travel agent know about your allergy during the booking process. Onboard: The Maitre' D will speak with you the first night at dinner and confirm your requirements. Also, remember to remind your server at each meal just to be on the safe side. When You Book: Notify your travel agent or call the line’s Special Services team at the time of booking by calling 407-566-3602. Onboard: Confirm your dietary request with the Head Server at dinner on the first night of your cruise, and remind your server at each meal. When You Book: Notify the line using a Special Requirements Information (SRI) Form 90 days prior to sailing. Onboard: The SRI will be passed on to the dining room manager and culinary manager to make advance preparations, but speak to the restaurant manager at dinner on the first night of your cruise as a precaution, and remind your server at each meal, too. When You Book: After you book, fill out this Special Needs Form online. Onboard: Confirm your request with the Guest Services desk when you board and with the Maitre d’ at dinner on the first night. As always, remind your server at every meal. At the buffet, staff will be happy to walk through with you and discuss which dishes are safe. When You Book: Contact the Access Desk prior to booking, as some requests may be easier to accommodate in certain geographical regions. Onboard: Confirm your request with the restaurant manager at dinner on the first night of your cruise, and remind your server at each meal. When You Book: Let Oceania or your travel agent know about your food allergy during the booking process. Onboard: The line’s ships have open-seating dining rooms, so the staff is always alerted to a guest’s dietary requests whenever that guest checks into a dining room. Still, remind your server as a precaution. When You Book: Tell Princess in writing of your allergy using the line’s Cruise Personalizer. Requests must be received no later than 35 days prior to departure for cruises to Alaska, Canada/New England, Caribbean, Hawaii, Mexico, Panama Canal, and Coastal Getaways, and no later than 65 days prior to departure for other destinations. Onboard: Confirm your request with the maitre d’ the first night of the cruise, and remind your server at every meal. When You Book: Send an email to the line at rsscops@rssc.com at least 90 days prior to sailing. Onboard: The line’s ships have open-seating dining rooms, so the staff is always alerted to a guest’s dietary request whenever that guest checks into a dining room. Still, remind your server as a precaution. When You Book: If you made your reservation at royalcaribbean.com, you can add your request to the “Update personal information” section. You can also send a request to special_needs@rccl.com with your name, booking number, ship name, sail date, and all relevant information regarding your allergy. Onboard: Allergies can best be accommodated in the main dining room. Confirm your dietary request with the restaurant manager at dinner the first night of the cruise, and remind your server at each meal. When You Book: Complete a Special Requirements Information Form and email it to access@seabourn.com. Onboard: On embarkation day, a member of the dining staff will speak to you individually in order to make the appropriate arrangements. Remind your server about your allergy at each meal, too. When You Book: Once booked, let Silversea know about your food allergies on the Guest Information Form in My Silversea at least 75 days before sailing. Onboard: Confirm your dietary request with the staff at dinner the first night of your cruise, and remind your server at each meal. When You Book: Once booked, let Viking know about your food allergies at least 90 days before sailing. Onboard: Confirm your dietary needs with the Maître d’ at dinner the first night of your cruise, and remind your server at each meal. You can also request the same server each night, so that they get to know you and your allergies as the cruise goes on. When You Book: When you book your cruise, inform the cruise line of your allergy. Your travel agent will be able to note it in the Special Requests section. Though it won’t appear in My Windstar, it will be noted on your booking. If you have specific needs, like almond milk instead of regular milk, etc., complete a Special Requirements Information Form and email the information to Wssupervisor@windstarcruises.com. Onboard: Once you board the yacht, ask to speak with the Executive Chef about your allergy. As always, remind your server at each meal, too. Article updated on March 7, 2019. How do you deal with your food allergies while cruising? This is a helpful list. No one should be led to feel everything will be fine on a cruise, though, simply because you fill out a form in advance and tell your waiter or maitre d'. My family cruised on the Caribbean Princess last month and had a hard time finding good food to eat. The ship stocked *no* alternative foods to accommodate our food allergies. (One son has multiple food allergies; another child and I can't eat wheat and he can't do dairy.) Food arrived dry with no dressing or margarine (rice, potato, steamed veggies, salad). There was no dairy-free ice cream at the ice cream stand. One night our child was given dessert that was strawberries with a spicy chipotle sauce, and another night it was a gluten-free cake with a liquer in it. Of course, being 5, he didn't like either one. We saw other kids eating ice cream and brownies, and my kids didn't have any allergy-free alternatives. If I knew, I would have brought cookies and margarine from home! No cruise passenger should think a cruise ship will stock alternative foods just because you tell them what your restrictions are. The Caribbean Princess expected us to just make do with what they had. Crystal Cruises should be removed from this list. The first time we travelled with them in 2012 they had us review the menu each evening so our selections could be checked and prepared without nuts if possible. I did have an incident where I was given a cookie I was assured contained no nuts and it turned out to be marzipan. If my daughter had eaten it instead of me, her reaction would have been much worse than mine. After spending two hours throwing up, I chalked it up to an innocent error. Our third and recent trip, however, was completely different. Crystal's service to people with allergies is now an abomination; they no longer make any attempt to protect passengers with food allergies. Crystal was alerted months before our travel of our families food allergies by our travel agent. A few weeks before traveling, the agent again checked with them and sent another reminder of the food we needed to avoid. Each meal we repeatedly told our servers that we had nut allergies and asked them to check to make sure each item ordered was free of nuts. We were REPEATEDLY given food containing nuts even after being assured the dishes contained no nuts! Some of the waiters were quite rude about it, and explained the nuts were only sprinkled on top or on the side as garnish, and surely we could just not eat them. At least four times during the trip they managed to "poison" me, sending me running back to my room to spend hours throwing up and scratching my skin off. Stumbling around on the ship light-headed and with a swollen tongue became a regular occurrence. Every night I'd sit and sadly watch my family eat dessert while I sat there with no dairy free, nut free options. The truly infuriating thing? Crystal will specially prepare elaborate desserts to favored tables simply because they "asked of it", but will do absolutely nothing to, let's just say, NOT KILL a passenger allergic to nuts. This trip left us totally disgusted.